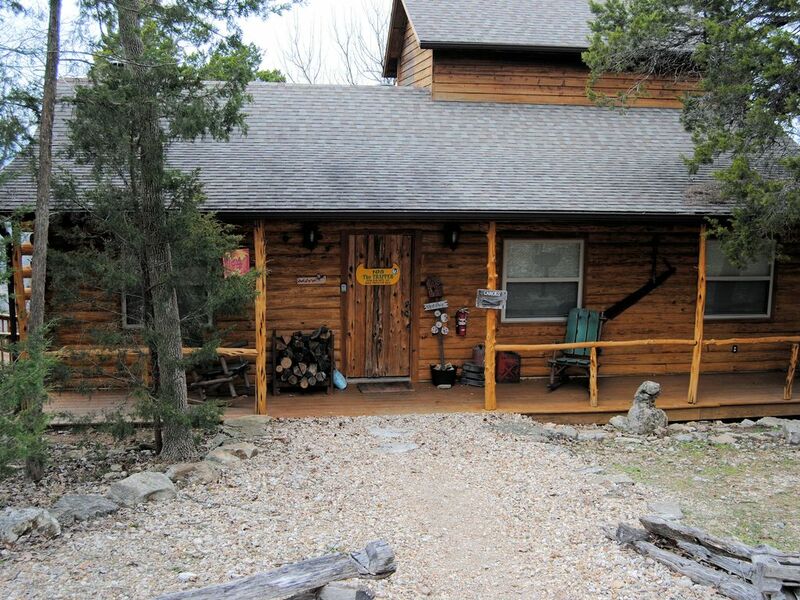 This beautiful 3 bedroom cabin is located on a bluff 400 ft above the White River with awesome views of Inspiration Valley, the White river and mountains beyond. The view is really spectacular! The main floor entry passes between two private Queen bedrooms and opens into a large living room featuring a massive wood burning fireplace. The large, fully equipped, eat-in kitchen is on your right. The large, comfortable bath room is located just off the kitchen. The third bedroom is located on the second floor and features a private balcony, king bed, and bathroom. The balcony is ideal for observing magnificent sunsets over Inspiration Valley. Experience a true private getaway from the stress of your daily life. You will not be interrupted by the jangling of a telephone or telemarketers as we have no telephones in our cabins. Beautiful mountain view from your private deck. A large private deck on the main floor, a balcony deck is located on the upper level, a third deck is located adjacent to the main level deck with a hot tub on it. Limited accessibility. Gravel slope to the front porch, one step up. What a beautiful cabin with a gorgeous view. Our family had a wonderful vacation last week. The cabin was warm, the lights were on and music playing to welcome us. The deck and hot tub was so relaxing. We will be back soon. A cozy, comfortable cabin -awesome view! We had a great time at the cabin. There was plenty of room for 3 couples to share a few days together. A great, large table for eating or playing games and a wonderful view from the porch made this trip extra nice. Sparkling clean kitchen and bathrooms and nice, comfy beds. Loved it! We absolutely loved it. Everything about the cabin was great. We will be back to stay. Thank you for the nice weekend! Our family really enjoyed the view and nice cabin! The cabin was perfect. It was decorated beautifully, beds were so comfortable, and once I got over my fear of heights and got the nerve to look over the edge of the deck I loved the view. We spent most of our time sitting out there. Didn't even turn on the television the whole weekend. Will definitely recommend this place to friends and hope to be back next year. My husband uses a walker so it was difficult for entry to the place for him, also the queen size bed was very soft and uncomfortable for him, and he complained that there really wasn't a comfortable chair in the living area that was easy to get out of. It was beautiful and a wonderful place for our family to get together, but next time we would have to pick a place that it more comfortable for my husband. Very relaxing, loved the hot tub, beautiful sunsets. We are centrally located on the White River in NW Arkansas between Beaver Lake (Famous for diving and Striper fishing) and Table Rock Lake with fishing, boating. Marinas on both lakes are less than 10 scenic miles away. Great trout fishing on the white river.